This weeks Loveliness Fair is on Simply Lovely Laundry. Simply LOVELY Laundry? Is laundry ever lovely, or simple for that matter!?!? A few weeks ago, I spent a day cleaning, organizing and decluttering our laundry room. That was the easy part. The hard part, is actually keeping it that way, and keeping up with the never ending laundry that comes along with a growing family. Now, I have never been a very organized mother, especially when it comes to our laundry. It seems that each time I begin to get a handle on it, another little person joins our family, and it takes me a while to adjust... That said, I am always on the lookout for ways in which to help this necessary chore run more smoothly. For me, it seems to boil down to one thing, Consistency. I find that if I stay on top of my laundry, it becomes quite easy and manageable-- this is the only time I ever think of our laundry as being either simple or lovely! On the other hand, the more laundry I have piling up, the less I feel like doing it, and the more I dislike it. Now, being consistent doesn't mean that you have to do laundry every day. I don't. But I do try to set laundry days that I am able to stick to. Right now, they are Monday (clothing only), Tuesday (clothing & towels), Thursday (clothing & sheets) and sometimes I will do a load or two on Saturday. Something that has helped me more than anything is following Marcia Ramslands "Same Day" Laundry Principle that she suggests in her book Simplify Your Life . She says that "you have a successful laundry system if the clothes that go into the washing machine complete the four steps of washing, drying, folding, and being put away--in the same day!" (So often I would find that I would get through the first three steps, but for some reason rarely finished that critical last step, and before I knew it I had piles of clothing all over our home.) I have found this to be true, with the exception of my hanging clothes... I hang them inside (I use our extra shower to do this), and sometimes they do take more than a day to dry, especially in the winter. But my goal is, that everything that comes out of my dryer must be put away before bed. Do I always do this? No. But, I do find that I am much happier and less stressed about my laundry when I do. Be ready to move clothes to the next step after thirty minutes. Save time by making the bed with sheets straight from the dryer. Stack clean towels by bathrooms to speed up delivery. Leave the washer lid open as a signal to empty the dryer. Save steps by keeping a lint box or wastebasket nearby. Close the lid after your last load and congratulate yourself for finishing all your laundry for the day. In addition to the above list, I have a sectioned hamper in my laundry room for the kids to sort their whites, colors and darks. It really helps to keep our laundry room so much neater and makes it easier for me to see at a glance with type of load I should do next. I have also trained my children to put away their own clothing. Even my 2 year old is able to help with putting away some of her own clothes, although, I do have to go into their rooms and straighten their drawers occasionally. She even loves to help by pairing the socks, which doubles as a learning activity!! More than anything though, I think the thing that has helped most is changing my attitude about doing laundry. 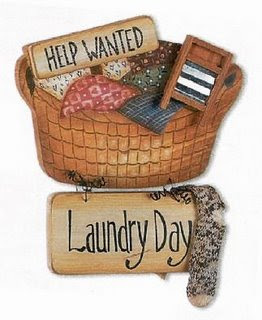 Although I usually have many other things I would rather be doing than laundry, it is indeed necessary, and through doing it I am taking care of my family and showing them, in one more way, that they are loved... And that is indeed lovely!!! You already saw my laundry post. The funny thing about laundry is that everything is "potential laundry". Like think about what you are wearing "potential laundry"...therefore it is never ending. Wow, I will never look at laundry the same way again. Thanks Jessica! Laundry is probably my least favorite task, I think because it is never done, literally since we DO wear clothes. haha! One thing that helps when hanging clothes inside, if at all possible, is to hang them in the room where your furnace is, the clothes will dry much faster in the winter. I do laundry for 4-5 days in a row, 1-3 loads each day then take 2 days off, if it gets to 3 days off, it piles up! I have been trying to look at laundry as an act of love lately. I try to think of Blessed Mother Teresa cleaning toilets in Calcutta and how she probably did not really want to do that, yet she did out of love. It makes the job offering up go much easier! Thanks for the great lovely post! Like all the others have said...laundry is my perpetual chore. ugh! Why is it so hard to stay on top of it? As I type there is dirty laundry to be washed, clean laundry to be folded and wet laundry to be dried...better go! Thanks for your tips Jessica! I have that laundry bag on my list too ;) I love it!!! The one thing that I have been doing the last few months, is getting those large mesh bags(lingerie bags) and hanging them by each of our landry baskets for socks. We each have our own bag. I just zip it and throw it in the wash. Then when they are dry, they are allready sorted for me. No more matching! I love it and it works. Haha we love you too Jess! And we'll iron any time! lol. Wonderful post Jessica. It's my first time here, and I am glad to see a home schooling mother who was herself home schooled. Children are such great sorters. I have mine sort clean laundry according to what belongs to what family member. It cuts my folding time in half, and makes putting clothes away simple. Having clothes actually get put away is a problem here as well - I certainly could relate to the piles of clean clothes growing and growing. Very helpful ideas. I loved your post on the Laundry. I am hosting the Loveliness of Spring Fair featuring Flowerpots over at my Attaining Virtue blog. So please send me links with posts and pictures of your spring flowers or send me an e-mail with your entry. Reflections on beauty and new life are encouraged and are also a personal need of the hostess. The Fair begins tomorrow on April 16. So please let's celebrate the visit of our Holy Father with an April shower of flowers. It is Colleen's birthday (http://footprintsonthefridge.typepad.com) on April 16. So you can wish her a happy day as well.